Alternate lives. Sometimes to experiment, sometimes to escape the hell a life has become, sometimes just a new way of experiencing things. That experience can be of life as a differing social position, differing gender, a differing species, or anything the mind can imagine. Fundamentally, there is no reason why an alternate life cannot become as real as any other type of life. As social VR, and total immersion technologies mature, the desire for an alternate life, may only be matched by the capability to provide, and survive, in such. Is it possible to immerse too deeply within a world, to the point perhaps, where you forget which is which? This film is a poinant reminder of the dangers of over-immersion. Not a threat just yet, it will be one day, and this whole film is a look at what happens when the virtual becomes so real that we can't tell the difference any more - albeit in a very disturbed virtual reality. In an environment where identity is fluid, what are the pitfalls of assuming the identity of another? This article helps with several case studies, and the degree of real legal trouble the person can get into. A valuable lesson on the necessity of both allowing a safety layer for subconscious desire to log out of a full immersive VR, and a reminder why transitions are not just pretty, they are a health and stress saver. A humerous story, set forth in the future, comparing the points of view of existence of a person outside of VR and wandering the physical world to those of a lifelong denizen of VR, freshly (and accidentally) awoken. A hypothetical situation of a 'nation' of people hooked into VR, and have been that way their whole lives. Every action they do, is done from the virtual, and for them, this article argues, nothing IS virtual. Theory of Objects taken to its scientific extreme says that every real object has physical properties that do this,that, and the other. This opposing argument for virtual objects as being the same, points out that everything we 'know' about many physical objects is actually inferred from theory, and we 'know' little at all. An interesting psychological article that looks at the role reversal between someone?s physical life and someone?s virtual life as they start to spend more time in the virtual than in the physical. It has particular emphasis for gameworlds, so many of the points do not really apply to worlds whose purpose is to improve quality of life. US and Canada region DVD of Tron; The first Hollywood film to feature computer mediated reality. Set in a cyberpunk-alike environment, Flynn, a programmer at a major software firm, is fired for all the wrong reasons. He sends Tron, a program written by himself into the computer mediated world to find evidence to vindicate himself. UK, South Africa, Middle East, and Europe region DVD of Tron; The first Hollywood film to feature computer mediated reality. Set in a cyberpunk-alike environment, Flynn, a programmer at a major software firm, is fired for all the wrong reasons. He sends Tron, a program written by himself into the computer mediated world to find evidence to vindicate himself. A relatively new class of world, less than a decade old. Social massively multi-participant worlds are there to allow you to form a life within the virtual, totally separate from anything physical. 3DEE is a social worlds system based on the ActiveWorlds codebase. Like all systems based on this code, it looks and feels a bit dated, which hides the power of the codebase. Planet Virtu?l in many ways, attempts to be an ideal virtual environement for online socialisation with limited technology. Its environment, particularly friendly to dial-up users, exhibits freedom of expression at every turn. It can be hard to truly explain the focus of a complex worlds system in a single article; this semi-slideshow format is designed to give you an overview in easilly digestible, bitesize chunks. in early June 2006 ActiveWorlds incorporated launched the 4.1 upgradeto the ActiveWorlds codebase. Nearly ten months past the official launch date, and four years since the last major upgrade, does this new codebase live up to the hopes of its patrons? Home, is Sony Corporation's current answer to the phenomenon of virtual worlds. Running solely on their Playstation Three console. It is hoped that when Home launches in late 2007, it will provide a true attraction, and a basic snow crash styled VR system that can expand and grow. From the creators of ToonTown, comes Disney's second attempt at a MMO. It is hard to believe this clunky, cludgy, yet graphically brilliant isometric world actually came from the same firm. Virtual Magic Kingdom is Disney?s attempt to put their ?Magic Kingdom? theme park online. Synthetic or virtual reality has a lot of detractors. However, there is no fundamental limit preventing it from being a full-fledged valid reality for those desiring a life alternate to the physical one. A short musing, based on a book quote as to the plausible future of social VR requiring biometric identification for all users. Gameindustry.biz take a look at Cities XL, Monte Cristo's ambitious product, attempting to combine a traditional city-simulation game with massively multiplayer online functionality, giving players the option to take part in a global, entirely player-dependent global economy. An image from Animatrix, of Agents driving a truck full of supplies to seal a glitch in the matrix, and a reasoned explanation of why they had to drive there, rather than just appearing. This likely has implications for actual, highly complex VRs as well. Here we see the floating island or laputa motif that is common throughout this world. One of the smaller laputa, fairly close to this one, can be seen slowly drifting on the currents of the air - not like a balloon, but with the sly deliberateness of a storm, or a very large and heavy chunk of rock. Podcast: David Perry on videogames - Will videogames become better than life? This podcast is a talk by game designer David Perry, on how games will become more than games in the relatively near future. Virtual realities will be created which for some, are more meaningful than life. A short video report of research progress by the University of California at Berkeley, on illustrating human rights through the medium of VR, focusing on Gone Gitmo, a virtual installation of Guant?namo in Second Life. On Sept. 18, 2007, Carnegie Mellon University lecturer Randy Pausch, dying of pancreatic cancer, gave his last lecture. The laputa is a very old concept. Coming straight from Gulliver's Travels, by Jonathan Swift, Laputa is a large part of the third tale. It is a flying island, one of the original such. A kingdom complete and unto itself, with almost no need of the world beyond. Thus, Laputa is almost analogous to a virtual world of modern and near future times. Debuting the same year as the Matrix, this gem of a VR film was sadly overshadowed by the blockbuster. Yet, it has an equally if not slightly more poignant VR concept. Industry news, originally posted 14-10-2003, deemed too important to allow to fade. In a pioneering experiment, control chips were grafted into the nervous systems of two monkeys, who were then able to demonstrate controlling virtual limbs simply with their thoughts. The research is one of the first steps to being able to control a virtual body, in just the same way as a physical one. Revisiting the Simulation Argument, and an essay on why detailed, immersive simulations on the scale of the Matrix movie might be built, the philosophy of whether or not you are living in one right now, and realistic explanation for many of the common expected fallicies of this argument. A press release from Late December 2004, featuring $26,500 US paid at auction for a virtual reality island within the bounds of social MMO Project Entropia. At the time, this was the largest single purchase ever made, indicating the cash potential of the market. A long and comprehensive piece about the MMORPG Everquest, the company behind it, and how this ageing behemoth is both staying fresh, and doing more to pressurise the growth of home computing power than anything else, for its 600,000 subscribers. October 2005, and Project Entropia hits the headlines forthe second time in a row, this time for $100,000 us paid for a VR-only space station, further demonstrating the potential for money making in modern virtual landscapes by the very fact it was keenly purchased as investment. A Cnet based overview of Jon Jacobs, purchaser of the $100,000 usd virtual spacestation in Project Entropia, and details of why Jacobs fully expects to earn $1.6 million usd a year from the purchase. BT futurologist Lesley Gavin looks ahead to a time when real and virtual worlds mix as easily as making a mobile phone call. A look at a quote from Count Zero, and on the likely reality of successful businesspeople living divorced from malfunctioning bodies, in ways they could never hope to leverage to be successful, today. Engaging wholly within the alternate existence provided by virtual form; casting off as much of the original as technology allows, and embracing the virtual. Is this even possible? A Virtual Life: A half-life? A sobering quote from Count Zero which does make you think. Even for those of us keen to experience life through the virtual as the great equalizer, unless we hit the point where VR is literally everywhere, with AR and physical life hopelessly intermingled and intertwined, a life solely through VR is always going to be a life at disadvantage, when interacting with others, who get to live in both. Are developers just thick, or something? An interesting spin of an article, this starts out looking at virtual worlds from the average participant?s perspective, pointing out all the desires and frustrations of the userbase with the speed of apparent technological development of the multiverse. Then spins that on its head and neatly answers those questions with the hard truths those of us who work with them are well aware of. A look at a simple yet profound quote of Arthur C Clarke's on connecting a remote waldo to your body such that you would not know the difference, and our thoughts on just how that would be accomplished practically. Net addiction side-effects. Not too dissimilar to drug withdrawal side effects when deprived of access to the net. Yet, is there a better way to circumvent the problem, than simply depriving individuals of a conduit they so often need, to salvage their mental health? When a person becomes truly totally immersed in any VR environment, their physical body almost ceases to be a part of them. The more senses are subsumed by the synthetic reality, the less connection the brain feels to the original body. This beautiful imagery has been replicated countless times in TV and film depictions of VR; attempts to describe the shift in sensations from the physical world, to an awakening in the virtual which at once makes it clear that this is a transition between realities. The concept of a talking head is one recognised in current VR development. It appears as either a waldo that can be controlled remotely, or an AI controlled personality. A quote from a cyberpunk novel has profound implications which stand up to scrutiny for actual sensory replacement. The ability to give the feeling of having a good body, of being physically fit, well, and beautiful to someone who is perhaps none of the above, would be a tremendous killer application, and perhaps extremely habit forming. A key set of experiments building on the rubber hand illusion, have opened the floodgates for full sensory immersion - proving that the brain will identify with the body it perceives itself to be in, not necessarily the body it is housed in. According to a study led by psychologists at the University of Toronto, the differences in human memory are triggered by the varying levels of emotional involvement in that memory's formation. In order to remember an experience in a full and lasting manner, emotional involvement is absolutely critical. This ten year old book, is a bit behind current advances, but is by no means behind the times. If anything, the changes since 1999, have only emphasised the points made in this volume, not diminished them. It argues that we are entering a virtual age, an age where information, minds themselves, are becoming divorced from their physical bodies. This single still is from the widescreen version of ?The Second Renaissance?, one of the Animatrix animated shorts. The full sequence encapsulates the id's version of the capabilities of VR, rather well. Here we see the end of the first machine war, in the Matrix universe. The humans have lost, badly. They were quite simply crushed under the indefatigable strength and power of the army of machines. Yet, instead of wiping their enemy out, instead we see a use very similar to the premise of the computer game Strife, or the Borg from Star Trek. It is also of course, not too dissimilar from the path we are currently on, although preferably without the war. Muscle attrition and weight gain are two of the enemies we must contend with when contemplating long-term immersion in a virtual environment. A health support system is absolutely essential for long-term usage. Research intended to help the chronically obese would be quite easy to re-purpose towards part of such a support system, providing some of the benefits of exercise to those whose bodies simply do not wish to know, whilst their minds are occupied elsewhere. In one of those uncommon times when space travel research and virtual reality development collide, the NASA bed rest study program is designed to observe the effects of staying in bed for long periods on healthy individuals. The VR angle is it is an excellent way to gather data about extended periods with the mind plumbed into a virtual reality environment with the body just?there. Otherland: Is this a real place? A lengthy quote from the book "Otherland: City of Golden Shadow", by Tad Williams, which sums up the dialectic between physical reality and virtual reality, in one of the most succinct and apt ways we have encountered. Second Skin was a 2007 documentary about virtual worlds and their impact on people's lives. It is a documentary that could not be more polarising if it tried, and there is plenty of evidence to suggest they did exactly that. In order to create a truly alternate life, totally separate from the physical, to 'begin anew' in the virtual, and live as the person you were meant to be, rather than live with the deck of cards you were dealt when you were born, what are the very basics required? Total immersion in an alternate reality is as old as the human race. Quite possibly they are even older than that. Dream realities, fantasies, campsite stories, the world of a good book. All stem from the desire to experience an alternative life, a different lifestyle, to be something different, or to escape what you are. 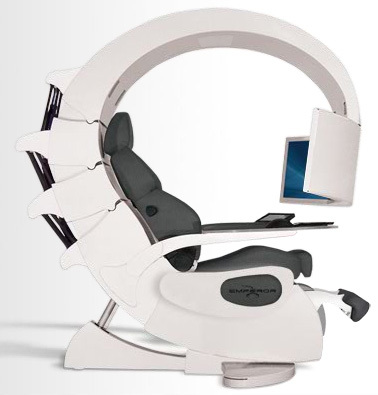 The Emperor Workstation is a high end work/gaming console from NovelQuest, designed as one in a long line of attempts at total immersion pods. World of Warcraft: Is It a Game or a Life? Msnbc takes a long, hard look at world of Warcraft, and considers whether it is in fact, a game, as is widely held, or if it is a harbinger of a truly, virtual life. Taking a look at just some of the possibilities for life, opened up within the possibility for alternate existence, and just what such a life might contain. A look at virtual worlds by BBC journalist Bill Thompson, and his feelings on how virtual environments still have a ways to go to replace our physical lives. Soundly reasoned and argued. Nick Carr's infamous blog posting on the electrical consumption of SecondLife and each avatar within it, breaking down their carbon emissions to be the same, roughly, as each person in Brazil. Identity. As we are able to recreate it more and more inside the virtual, can we also take more and more of another's, as well? A quote from Otherland: Book One Reminding us that whilst we may wish otherwise, for as long as our brains are physically outside the simulation, there are always going to be limits on how they can affect us. BBC journalist Bill Thompson on the different recreations of self through various online systems - each allows you to fully reinvent ... you. Gerri Sinclair is a very busy futurist. She has created companies, sold them on to Fortune 500s, been a US government advisor, and taught new media. This article is basically an interview with her on her thoughts of the future of the metaverse and avatar-based life - the subject she continually founds successful ventures on. If the best way for an individual to live life, as is true for a fair segment of the population; if they desire happiness, and a life in which they are not judged for their physical shell, but for whom they are themselves, is to retreat from the physical, into the virtual, then this brings up certain challenges. This single still is from the widescreen version of ?Program?, one of the Animatrix animated shorts. It conceptualizes the deep ridden id desire for a better body, to be a better person ,and to have the whole world, revolve around you, and your actions. An interview by 'Rock, Paper, Shotgun' conducted January 2008 with legendary MMO developer Raph Koster, outlines his continuing plans for user-content creation MMOs. A warning, published by Forbes, on the simple, pretty much unarguable fact that our concept of reality is changing, and changing fast. It will not be all that long before virtual and physical realities are interchangable, and little to do but prepare. Food. It is tricky to recreate this sloppy, messy substance with so much variation in VR graphically. We are just beginning to conquer it, in prerendered VR scenes; never mind interactive VR. An interesting study looks at how we differentiate real characters from fictional characters, and its not done the way you might think. Instead, reality and fiction are highly subjective traits, different for each individual, depending on how their reality is based. An unintentionally humourous decade old article from the MUD community, about how, once any VR becomes popular, the masses flood in, and all of a sudden, the fragile system you had built up collectively, is gone. Replaced by mass culture. Chat-based VR is impersonal. With the currently available levels of technology for this home-based social VR type, it has to be. Such systems are very good for communication, but if you try to go much beyond communication, into full-blown social interaction, dating, lifestyle, and well, life, you run into a problem. Sixteen Millimeter Shrine is an odd little episode of the Twilight Zone Very, very powerful in the way it handles the concept of escapism. Creating a new world to live in after the old, outside world becomes intolerable. Preserving the last shreds of sanity as all else falls apart. This episode speaks of the healing power of virtual worlds in all but name. A 2008 study of MMO players challenged the stereotype that overweight, solitary males are the only participants. The result of the study by the University of Delaware showed 40% of participants are female. The predictably over-paranoid US government has begun to take its spy networks into cyberspace, targeting virtual environments for terrorist-like activity. Project codename Reynard aims to recognise "normal" behaviour in online worlds and home in on "anomalous" activity. The results of a 2006-2009 study on using believable VR to teach why bullying is bad have been published, and it just might have revolutionized AI along the way. An old, but still very apt document on the issues that arrive when one member of the household really gets the joy of a VR environment ? any VR environment, and truly clicks with it. Then tries to explain it to the rest of their household, or to their offline friends and family.